A fresh batch of tools you’ll want to consider for your projects. In this article we've gathered the best new tools for developers released over the past 12 months or so. Whether you’re deciding on a framework, something specific for your build or testing process, a React component or something else, this list should be a good starting point to help you solve some of the specific problems you face as a frontend or full-stack developer. 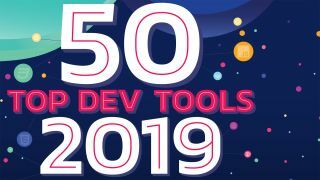 For even more awesome tools, take a look at our roundup of the best tools for web designers, or dive into last year's 50 top developer tools 2018. Parcel is a beautifully fast, multi-featured web application bundler that requires minimal configuration and has become incredibly popular in a relatively short amount of time. The fact that this tool requires such little configuration makes it an attractive option for those that are new to build tools. This webpack plugin enables you to inline the critical CSS of your app and then lazy-load the rest. It's fast and lightweight because it doesn’t use a headless browser to render content. Sucrase is an alternative to Babel (the popular ES6+ compiler), which focuses on non-standard language extensions such as TypeScript, JSX and Flow. This means that compiling is 20 times faster than Babel. You can give this one a test run online before deciding whether to commit to using it in your project. A web tool and CLI you can use to create a personalised and optimised webpack.config.js file. Although it doesn’t yet support advanced options like code splitting, the existing features will build your file based on industry best practices for reducing webpack bundle size. A framework-agnostic and feature-rich CLI tool for kicking off your progressive web apps. Quickly scaffold new projects with your preferred view library and toolkit and then get it all started with specific best practices and optimisations built in. This developer tool is composed of two parts: a minimalistic static site generator with a Vue-powered theming system and plugin API; and a default theme optimised for writing technical documentation. Each page generated by VuePress has its own pre-rendered static HTML, which provides great loading performance. It's also SEO-friendly. From the Polymer team, this is a set of starter templates for generating full-featured progressive web apps using web components. The components are responsive, fast loading, and easy to customise. PaperCSS touts itself as being 'the less formal CSS framework', and was created to offer something different to the typical modern, clean approach typical with other CSS frameworks. Its components feature a relaxed, hand-drawn look. This framework aims to be as minimal as possible when adding classes. Accessibility is a major reason for trying this tool out, because all of the components comply with the WAI-ARIA specification. Each component follows the Single Element Pattern, meaning you can enjoy the same consistency that is possible from native HTML elements and components can be leveraged to make something new. A flexible React UI framework for building enterprise-grade web applications. Evergreen contains a set of polished React components that include layout components, buttons, form elements, an autocomplete widget, file picker and lots more. This is a simple tool used for creating CSS animations, available as a Chrome extension or web editor. It uses a timeline setup, which enables you to create and view your animations from the one place – no more flitting between browser and editor. A CSS-in-JS library that promises users a high level of performance and flexibility. It manages to steer clear of CSS specificity problems by using predictable composition and it takes no time at all to style apps using the string or object styles. A modern alternative to Normalize.css (the popular CSS reset), except smaller, and targeted mainly at the latest versions of modern browsers. A straightforward, open source library for creating UX patterns such as menus, sliders, lightboxes, parallax effects, page-swipes and zoom effects in pure HTML. Use it to create intuitive, visually intense, mobile app-like experiences for use on the web. An incredibly fast CSS solution for design systems or app components. You create the CSS using components, which adhere to stylesheets inspired by some of the best in the business, including CSS Modules, BEM and Atomic CSS. Basin is a simple form back end solution for designers and developers. It saves development time so you can start collecting form submissions and tracking conversions without having to get involved with any back end coding. This starter, open source CSS framework includes styles for a flexbox-based 12-column grid, along with attractive progress bars, buttons, form elements, pricing tables, cards and more. It also produces nice, small files sizes.